✅ Trip Verified | Palma de Mallorca airport is quite big, so it takes some time to get from point A to B. The staff are friendly but have to improve their english. Is clean and with a lot of light. Not Verified | Absolutely disgusted, disgraceful airport. We returned back to the uk today then picked one of our cases up from the luggage belt then waited another hour only to find that Palma Airport “forgot” to put 30 of the Birmingham airport cases on the plane! Of course one was mine. How on earth can you “forget” to put the cases on when we checked them in together! And they were labelled with the airport we were coming from and going to! Absolutely careless bunch of staff. Not only this but we have to wait another 2 days for to fly them back and over to us! ✅ Trip Verified | Since our last transit through Palma Airport in May, new electronic passport gates have been installed and these seem to have made a big difference. There is a long row of them for each of arrivals and departures and, at the moment at least, plenty of agents standing by to assist passengers. Trying simultaneously to read the instructions and face the camera was a little tricky on arrival, but familiarity with the process made things easier on departure. 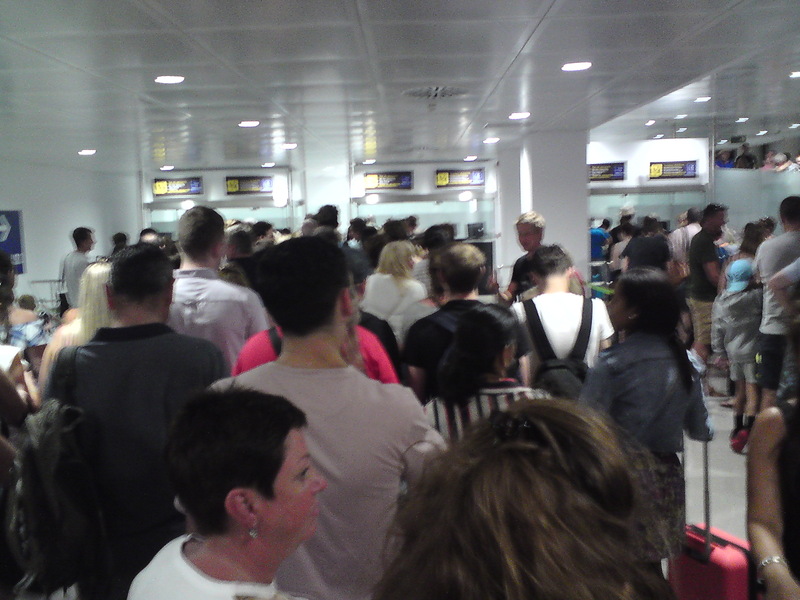 Doubtless there will be more pressure on the new gates in the high season, but for us there was no delay at all at passport control. It did mean that we took a new route out of the airport and it was a few minutes before we reached and recognised the old gate area. Apart from the novelty of the new passport control, everything was much as usual for us as we navigated the airport. There were no hold-ups at security and we had the half-expected long walk to a distant gate, but we look upon that as useful exercise before 2 hours plus confined in an aircraft seat. "tannoy system won’t update you"
✅ Trip Verified | I am currently sat in the airport after standing in a queue for over 20mins to be told I can’t check in until 9am and I need to get back in the queue at this time. I think this is disgusting there are two check in desks open for Ryanair, surely it would have been easier to just check us in and get us through otherwise you should have a member of staff giving this information because the display screens give you the check in desks and the tannoy system says it won’t update you. Now the queue has doubled in size!! May I suggest you don’t put check in desk numbers on the display screens until Ryanair are ready to check people in. "inaccessible to a wheelchair user"
Not Verified | We arrived after our flight and a family member experienced a terrible ordeal as they needed assistance to disembark. Two people arrived on the plane, threw them onto a small wheelchair as they do not know anything about handling people with mobility problems and proceeded to push them the full length of the aeroplane banging their hip on every seat even though they were shouting out in pain! On the return journey they required an accessible toilet on arrival at the airport which we could not locate. We were approached by someone with a wheelchair symbol on their back, indicating they were there for people with disabilties. We were directed to the main toilet and told that the accessible toilet was at the end of the row of the others. Due to the narrow access into the main tolets, it was totally inaccessible to a wheelchair user. We were then taken to the desk for assistance to be greeted by really rude people. My family member could not go to the toilet downstairs as it appears they think wheelchair users can push past people queueing and get through a very narrow space, absolutely disgusting. Terrible service for people with needs! Not Verified | Hell on earth is the only way I can describe our experience. As a seasoned traveller this has to be the worst airport so far. 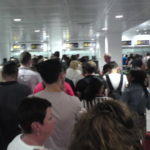 Horrendous walks from gates to passport control only to be greeting by terribly long queues, 1 staff at passport control who are content to laugh and chat with each other while 100s of holiday makers wait. Return journey 4 desks on for 3 flights massive queues for so bad and delays so high that the ended up having to pull us and our flight members out of the queue as check in had passed then had long walk to passport control to face more queue to then rush to queue to board plane l. What a terrible experience. "45 minutes to show our passports"
Not Verified | I as a norm like this airport. When we where on are way home we had to stand for 45 minutes to show our passports. There were hundreds of people waiting even young children. It was grim. One person tried to run through as they where going to miss their flight. There was only 2 staff on for 45 minutes and they where deliberately going very slow. If it happens again we will give Palma a miss. When more inspectors did arrive hundreds of passengers raced through to their gates - grim service. "Worst part of the holiday"
Not Verified | No smoking areas past security for customers, but you can tell the staff have access to smoking areas. The security staff demanded receipts for all things in my duty free bags and refused to provide documentation that substantiates their claims. I was expected to take their word on their authority which was a violation of my rights. Staff at one of the food services inside the airport prior to security lied to us and told us only one restaurant was open past securitysecurity and it just sells burgers, just so he could sell us a microwaved sandwich. Worst part of the holiday. Will not be returning to Majorca any time soon. Not Verified | On arrival at this airport it was refreshing to be met by the special assistance team who on this occasion were professional and pleasant. On our last trip to this airport I wrote a review lambasting the organisation at this airport for the utter unprofessional attitude of the team. This time they were brilliant and we were on our way with the minimum of fuss. Thank you very much. Not Verified | On departure from this airport we were faced with a problem regarding the disposal of my wife's three wheeled walker. At the special assistance desk I was told to take the walker to the security belt at the other end of the terminal as the one next to the special assistance desk was not to be used for TUI passengers. This is totally ridiculous. This is a long walk and having to leave my wife by herself was not a good idea as it upset her.